We are starting to collect links of attendees that posted pics. More to come - my daughter took some great ones, so stay tuned. Lee, feel free to grab the links for the Tomatopalooza site. I am just recovering from yesterday - a great day, exhausting, fun, enlightening, perfect weather, people from all over.....will say more once I get my wits about me again! Thanks to everyone associated with the event for making it another memorable day for all! I went through the pictures rapidly, and will go back this week and look at the tomatoes, but I always like seeing who I can ID, and of course I saw you, and Sue and Lee, but was Shoe there as well? I thought I saw a Shoe-like body with back side towards the camera. How I would have loved to have been there or at any of the Tomato Events that are listed in that section of the TV website. That's OK, though b/c I can wait for Freda to tell me how my plants are doing and I can look out this panel of low windows that face out on the backyard and watch the deer eat my roses. Had a great time on Sat. Thanks to Craig, Lee, Patrina, Sue, Jerry, Craig's daughters and others who's names I've forgotten. Great to put faces to the names and meet you guys. Even though I stayed a few hours, (3 1/2), I enjoyed it and won't miss another. Great site too. Nice people, gardens, and plenty of shade!! 1 - Summertime Gold. Great refreshing tomato. Really awakened your taste buds. Not your typical deep taste but 'bright' in taste and color. If that makes any sense. 2 - Tasmaninan Chocolate - Thanks for bringing it Lee. For one you thought you were going to leave home, it was a hit! Darker flavor with great color. 3 - Perth Pride - Most at the table agreed that this was one of the better ones there. 4, 5 - Dinky and Muddy - Two similar looking and tasting toms that I went back for seconds, thirds, forths .....Not the biggest but made up for it in flavor. Love to see the how much fruit comes off the plants. 5b - Grumpy F4 - I know I grew and brought this one but I don't think I'm being bias but it's one that will be grown again in my garden next yeat for sure. Even balance of meat and gel, great dark orange color with a smooth taste. Glad I tried it. 1 - Shannon's. Bold taste that alot of people loved. Wish I had brought more. Aaaargh!! Beutiful bright red color with a taste that explodes in your mouth. Does not hold flavor back. 2 - Cuostralee. This is my 'Must grow' for next year. This is one of your plain tomato sandwiches tomato. I wouldn't want to mask the flavor with alot of spices or meats. To me, this one needs to be eaten plain. Great solid flavor that lingers. 'Classic' tomato taste that was tough to beat. Nothing shy about it but a very strong, soft in your mouth taste. Not mealy or weak. 3 - Purple Russian - Great balance of deep flavor. Second 'must grow' for next year. Very pretty color. 4 - Heatherington Pink - One of those that caught my eye as well as taste buds. I'm going to look into this one for sure. 5 - Mexico Midgit - How can something so small have sooooo much flavor. About the size of a pea but each one had great tomato taste. I'll look into this one too. Great for the kiddles. One's that stood out but..
Sun Sugar - The MOST 'burst of flavor' tomato there BUT I think I could only eat a few at a time as they were too sweet for my buds! Little liquid balls of sugar. Each packet of seeds should come with a free dental check-up!! Thanks again Ladies and Gents, and will see you there next year. Blue - did nothing for me in taste or looks. The Greens - First time trying the Greens and will wait until next TP to try them again. Not for me. Couple of pics of Craig adressing the troops and showing Patrina hard at work! Boy, those two know thier Dwarves!! Patrina, let me know if you got that half-ripe Shannon's through customs!! Starting to recover a bit!!! (slept till nearly 9 AM today, which is quite unusual for me). So, thanks so much to Jimmy and Fred for putting up with the invasion of their little slice of heaven. Thanks to Lee for putting so much energy, enthusiasm, time and planning. Thanks to my family - Sue, Sara, and Caitlin; to my friends old and new - Patrina, Jeff, and Gary (and Sara's friend Allison); to the various Tomatovillians and their families who attended (esp. those who came from afar, such as Jerry and his wonderful wife, Deb; to Greg - those pictures are amazing! 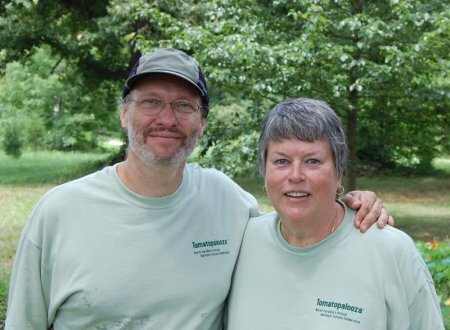 - Tim and his wife, a truly supreme slicer/cutter of tomatoes!) - this event has become a bit beyond what Lee and I imagined when we started Tomatopalooza 6 years ago. It takes a bit of time to set up, but I think we got some things right on the organization part of the event (welcome table, contact sheet, renting sufficient tables, creating a Tshirt, etc). Hard to believe that with quite a few of us getting there at 9 or so, we still just about got things ready by 1 PM! And, despite the yellow jacket nest discovered in the morning, no one got stung (great action on ensuring that things were under control prior to the start!). On the tomatoes....just a generally disappointing year for flavors, yields, number of varieties. We've noted for some time that this was a very odd growing season. To me, some of the best flavors came from the Dwarf table (which is great news for the project!). In previous years, we had such an overabunance of tomatoes that we gave them away by the loads after the event. No so this year - bicolors, greens and whites were significantly underrepresented. Blacks and browns as well.....well, maybe everything was a bit underrepresented! So, for next year....do we move the date? The day (we've had some requests for Sunday, rather than Saturday)? The location certainly works perfectly of course....if Jimmy and Fred will continue to have us, of course! We certainly missed those Tomatovillians we've had in the past who for various reasons couldn't attend. Thanks for a wonderful day filled with fine company, good tastings and fun music. As usual Lee, Craig and all the others involved with putting on TomatoPalooza each year did a terrific job. Even Lee’s directions were good. A great big thanks to Fred and Jimmy for their hospitality. While I tend to agree with Craig that this year's tomatoes didn't taste as good as in previous years, I did manage to eat several White Bread, Mayo and Tomato sandwiches.8) Several people mentioned they thought last year's NC drought may have been a factor in this year's poor taste. It would be interesting to know how many of the fruit at T'Palooza were grown from last year's seed. Several of the Dwarfs hold great promise. My favorites were in the Purple/Black area. But that’s what I’m partial to in ‘regular’ tomatoes as well. A special thanks to Patrina and Craig for co-coordinating the Dwarf project and to all those who have grown them. I’m looking forward to sampling more of them in the future. What a great day we had out at the farm! It was great to see a lot of familiar, friendly faces. Jerry, Tim, Jim, Rock, Greg, and others. Also, it was nice to meet Jeff and Patrina as well as Craig's former co-worker Gary. Fred for hosting the event again this year. Thanks so much! The weather was great! High 80s, slightly overcast, with a pleasant breeze. people from 4 continents! Yes I said contenents! Australia, Asia, Europe, and N. America. Everyone seemes to have a great time viewing, learning, tasting, and talking tomatoes all afternoon. As Craig mentioned, the tomatoes were a little off this year. 138 varieties were represented, the lowest number since 2003.
absent. However, we did have a large assortment of the bi-colors this year!. varieties were under/over ripe, there were quite a few that just didn't taste up to normal standards. just OK.... Others though were quite good. Spear's Tennessee Green was excellent again as was Purple Haze which Greg brought. One of the Anna Banana Russians was quite fruity in flavor! Yumo! Striped Sweetheart (a new variety this year) was also well received. There were a lot tied for #4! Kellogg's Breakfast from JimM_SC won the biggest competition at 22oz! A Hugh's and Kosovo came in a close second at 20oz. were asking when/where they could get these new varieties! from everyone. I guess the later fruit have become better tasting than my initial samplings. a better flavor than before, so now I've got two of those to carry on. All and all a very enjoyable day! Thanks to all for making our hosting the event very easy and enjoyable. It was another perfect day, the kind of day that requires pinching to make sure one isn't dreaming. My goal next year: to actually taste some tomatoes! And I still don't have any ripe fruits in my own garden. It's great to look at all the wonderful photos people are sharing - and how is it that every single person is smiling? It sounds like a blast and I'll enjoy catching up on the pictures, lists, etc. I'm glad it turned out well for all of you! I thouroghly enjoyed this year's event. One of the highlights for me (besides the tomatoes) was a side dish on the food table. It was a spicy relish with cracked wheat and cherry tomatoes. I would love to get the recipe. Does anyone know if this recipe is posted or who made the dish for Tomatopalooza VI? Folks, I had a WONDERFUL time at Tomatopalooza meeting people and chatting about the Dwarf Project. After the hot and humid days leading up to the event, it was a welcome relief from the heat to be in such beautiful surroundings and under some shady trees with a nice breeze to keep us cool! It was fantastic to meet people who I've previously interacted with over the internet, and how fascinating to match faces to identities... it really was a great privilege to be able to attend, and kudos to Lee and Craig for their organisation. 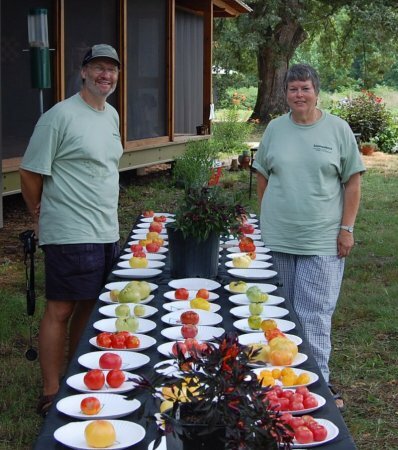 Efland is a fantastic place to have Tomatopalooza, how lucky to be there! I didn't take many pics, just individual pics of the dwarf tomatoes, because once the event was underway I just didn't get back to my camera! Thankfully I got someone to take a couple pics with my camera early. Here's a pic of Craig and me, and another of us standing by the table of tomatoes of the Dwarf Project. I want to say a HUGE "THANK YOU" to Craig for taking me in at short notice when I curtailed my time in Europe a little early and just arrived on his doorstep very exhausted! I rested and recovered in such a relaxed environment - Sue and Craig's place is really a haven of both comfort and delights. He has the most wonderful environment there to enjoy nature, the garden, birds and bees, play with the gorgeous chocolate labs... I just soaked it all in for 9 awesome days! It was such a pleasure to meet Sue and the girls too - I LOVE this family!! Wonderful to meet Lee (who I got to know a little because we had several meetings during that week), Jeff (who stayed at Craig's for the weekend and we had good chats), Greg, Jerry, Celticman (whose real name I have temporarily forgotten), Paul, and spouses, plus other new folks - forgive me if I've left out names, I remember all your faces!! I was hoping to see a few other folks there too, but sadly for whatever reason they didn't make it this time. Way to make the tomato voyage Patrina. Hopefully you smuggled some tomato seeds back in your shoe. If only... Brad! Too naive, thinking that it was better to post them, HA!